At E3, we finally saw significant footage of Beyond Good and Evil 2. The Space Monkey program in partnership with HitRecord is looking to source some artwork for the final game from the community. Ubisoft has released a video breakdown of the E3 cinematic trailer for Beyond Good and Evil 2, and details of how fans can contribute to the game via creative collaboration platform HitRECord. Ubisoft reveals dramatic and stunning cinematic trailer for the highly anticipated upcoming prequel, Beyond Good and Evil 2. Three weeks ago, we saw the first gameplay from the title. The gameplay was actually part of the second Space Monkey Report livestream, and this has now been released in full for eager fans to watch again. The video shows how players can travel around the world using jetpacks and ships. We also get a glimpse at a different aspect of the game: melee combat. Six months after the original trailer debuted at E3 2017, Beyond Good and Evil 2 has its first live stream that took place in a replica of the game's Gada ship, with real-life collectables from the game and a smoke machine. 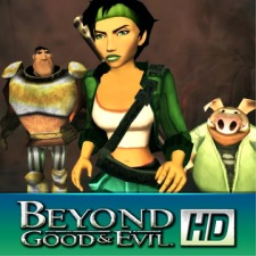 The first Beyond Good and Evil game with trophies was Beyond Good & Evil HD, which was developed by Ubisoft Shanghai, published by Ubisoft and released on 28 June 2011. The next Beyond Good and Evil game scheduled for release is Beyond Good and Evil 2 for PlayStation 4. The release date has not yet been announced.